Long-term systematic observations of noctilucent clouds in the regions of Moscow (Russia), Vilnius (Lithuania), and La Ronge (Canada) are considered. Variables, describing the seasonal activity of noctilucent clouds, are discussed. It is shown that there are no statistically significant trends within time intervals of several recent decades. This result is compared to other known findings on trends in mesospheric clouds. Based on the data of the modern ground-based noctilucent cloud observing network in the northern hemisphere and simultaneous satellite data on mesospheric temperature and humidity, we estimate sensitivity of noctilucent clouds to the relative humidity of the upper mesosphere. Such an approach allows us to discuss possible changes of the upper-mesospheric relative humidity, which are consistent with a zero secular trend in noctilucent cloud activity. There is an intense ongoing effort on studies of long-term trends in occurrence frequency and brightness of mesospheric clouds, termed noctilucent clouds (NLCs) as observed from the ground and polar mesospheric clouds (PMCs) as observed from the space, in connection to global climate change and related changes of upper atmosphere environment, in particular (Thomas 2003). However, the different approaches arrived to controversial conclusions on the subject which suggest either continuously increasing NLC numbers over Western Europe (Gadsden 1990, 1998) and PMC activity for sub-polar and polar latitudes (DeLand et al. 2006, 2007; Shettle et al. 2009) or zero-trends derived from ground-based observations (Romejko et al. 2002, 2003; Dalin et al. 2006; Kirkwood et al. 2008; Dubietis et al. 2010). The main reasons for these differences are attributed to different analyzed variables, different time intervals and latitude range used for the analysis and inhomogeneity of the datasets (Dalin et al. 2006; Kirkwood et al. 2008). On the other hand, the established relationship between the time series describing the NLC/PMC activity, temperature, and water vapor (Hervig and Siskind 2006; Lübken et al. 2009) poses an important question what conclusions about the physical state of summer mesosphere may be obtained from the zero NLC trend result. In this paper, the long-term trends in the ground-based NLC observations from Moscow (56°N, 37°E, Russia), Vilnius (55°N, 26°E, Lithuania), and La Ronge (55°N, 105°W, Canada) with corresponding latitudes of the observed NLC between 57° and 62°N are considered. 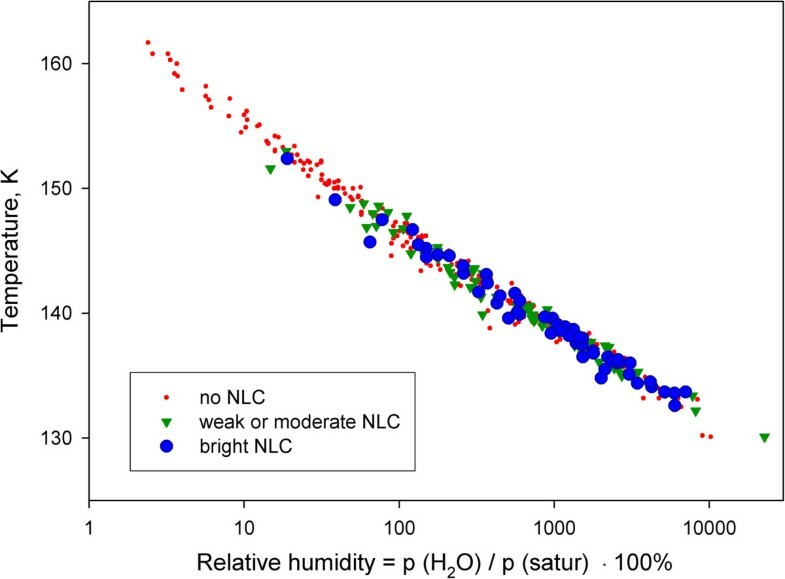 It is found that a zero trend in NLC corresponds to a zero trend in the number of summer nights with the relative humidity more than 100% in the mesopause layer where NLC may exist. Our finding logically follows from the hypothesis that NLC presence or absence is governed mainly by temperature and humidity at mesospheric heights where NLC exist or are expected to be formed and is supported by comparing the satellite measurements of mesospheric temperature and humidity and the data of international ground-based network of automated NLC cameras (Dalin et al. 2011). The methodology and data sets of ground-based NLC observations in Moscow (Russia), Vilnius (Lithuania), and La Ronge (Canada) are outlined in papers by Romejko et al. (2002), Romejko et al. (2003), Dubietis et al. (2010), Dubietis et al. (2011), and Zalcik et al. (2014). All three databases were published and discussed previously but never were considered together. It is important that in the present study, all three databases were updated up to the last observational season of 2013. The technique of NLC observations is about the same in all the databases. To consider year-to-year variability of NLC activity according to ground-based NLC observations, we use several variables and study the corresponding time series within the same year period. For every summer season, the following parameters are determined: the number of nights with NLC displays, the NLC brightness accumulated for the whole season, and the number of clear and semiclear weather nights. The latter is of paramount importance since the NLC activity from ground-based observations is strongly biased by local tropospheric conditions. Also, as will be demonstrated below, the number of clear weather nights is a robust normalizing factor, when considering data sets with a different length of observational period. Trend in the seasonal numbers of Moscow NLC nights. (a) The number of NLC nights according to the Moscow data for 1990 to 2013 without a weather correction factor. (b) Relative (weather-corrected) numbers of NLC nights. The script in the upper left corner shows the 2-D linear regression model versus time and solar Ly α flux. The contribution of both arguments is given by the blue line, the contribution of the time-trend is shown by the black thick line, and the thin red curves denote 95% confidence limits. where b1 and b2 are the regression coefficients for the time trend and for the solar Ly alpha flux (averaged for June to July of each year), respectively, b3 is the constant, and Ts is the start year of the time series. The solar Ly alpha flux has been analyzed by means of satellite data via Composite Solar Lyman-alpha (2007). In Equation 1, the Ly alpha flux component includes a potential phase lag relative to the NLC cycle, which is defined by a standard cross-correlation analysis between two periodical processes. The 2-D linear regression model is indicated by the blue curve, and the long-term trend (after subtraction of the solar component) is shown by the black thick line. The red curves show a 95% confidence interval for the long-term trend.Figure 1a shows a significant increase in the NLC occurrence number since 2005. This is due to applying digital cameras (‘digital era’) in NLC observations, thus allowing us to conduct observations for a much longer (2.5 months) period of time compared to the previous ‘visual era’ (about 1 month) before 2005. At the same time, there is a robust way to compare the ‘visual’ and ‘digital’ era, namely, by considering the number of clear and semiclear weather nights in each observational season. If we normalize the NLC occurrence number by the number of clear and semiclear weather nights, we obtain weather-corrected relative NLC numbers for the entire time period, as shown in Figure 1b. 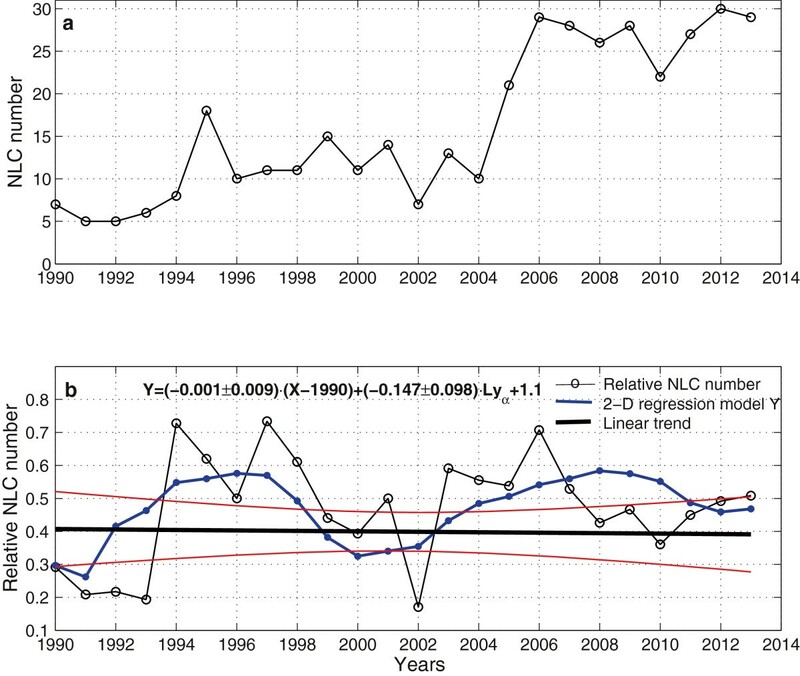 The above mentioned 2-D regression analysis has been applied to the normalized or relative NLC occurrence number. One can see there is a slight negative trend which lacks statistical significance. One should note that we keep exactly the same local times (23:00 to 04:00) both for the visual and digital era, a great advantage of our ground-based NLC observations. Thus, there is no bias due to the local time changing. Figure 2a illustrates the time series of the Moscow NLC brightness for 1990 to 2013. One can see a similar pronounced feature, increased NLC brightness from the digital era of 2005. The relative NLC brightness (normalized by the number of clear and semiclear weather nights) is shown in Figure 2b, for which the same multiple regression analysis was applied. In agreement with the above finding for the NLC occurrence number, there is no statistically significant trend in the relative NLC brightness for more than two decades. Trend in the Moscow seasonal integral NLC brightness. (a) The NLC brightness according to the Moscow data for 1990 to 2013 without a weather correction factor; (b) the same but with weather corrections. The script in the upper left corner shows the 2-D linear regression model versus time and solar Ly α flux. The contribution of both arguments is given by the blue line, the contribution of the time trend is shown by the black thick line, and the thin red curves denote 95% confidence limits. Very similar results for the relative NLC numbers after a weather correction were obtained for Lithuanian (Vilnius) and Canadian (La Ronge) data (Figures 3 and 4). A slightly positive statistically insignificant trend is derived for Lithuanian data, and a nearly zero trend for Canadian data. All the regression coefficients and their 95% confidence levels as well as phase lag vs. Ly alpha flux are summarized in Table 1. Moscow and Lithuanian data have the statistically significant regression with Ly alpha flux and show the lag 0 to 1 year (over the anti-correlation) which is consistent with 0.8 years lag according to HALOE PMC extinction for 65 to 70°N (Hervig and Siskind 2006). Different scales for the relative NLC number in Figures 1b, 3b, and 4b are caused by different approaches taking into account tropospheric cloudiness as described in detail by Romejko et al. (2003) for the Moscow data, Dubietis et al. (2010) for the Lithuanian data, and Zalcik et al. (2014) for the Canadian data. Nevertheless, in all cases, within the considered time period (1990 to 2013), there was no statistically significant trend in both the weather-corrected NLC number over a season and the weather-corrected NLC brightness. A similar conclusion was derived by Dalin et al. (2006) for Moscow time series (1962 to 2005) and Moscow and Danish time series (1983 to 2005). Trend in the seasonal numbers of Lithuanian NLC nights. 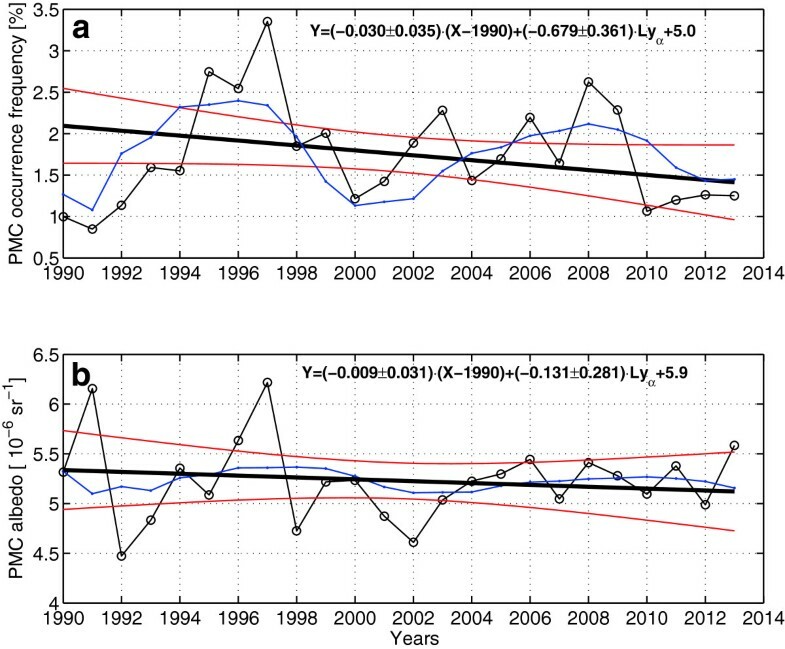 The same as in Figure 1a, b but for the Lithuanian data sets in 1992 to 2013. Trend in the seasonal numbers of Canadian NLC nights. The same as in Figure 1a, b but for the Canadian data sets in 1990 to 2013. The table contains the results of ground-based NLC observations and of the space-borne PMC measurements at 50 to 64°N (the latter are consistent with DeLand and Thomas (2014) and are provided by M. DeLand). Lag equal to 0 means that the NLC/PMC cycle is exactly in the anti-correlation with the solar cycle, while positive lag means that the maximum of NLC/PMC is delayed with respect to minimum of Ly alpha flux. As suggested by Dalin and Pertsev (2011b), the alleged contradiction noted by many researchers, between the positive trend in PMC occurrence frequency (Shettle et al. 2009) and zero trend in NLC occurrence frequency, is reduced to a great extent when considering the same time intervals and the same latitude range (50 to 64°N) for PMC (Shettle et al. 2009) and for NLC data sets. Recently, the PMC time series obtained through the solar backscattered ultraviolet (SBUV) space-borne measurements were refined by DeLand and Thomas (2014), using a different setting for the PMC detection threshold (see the paper for details). 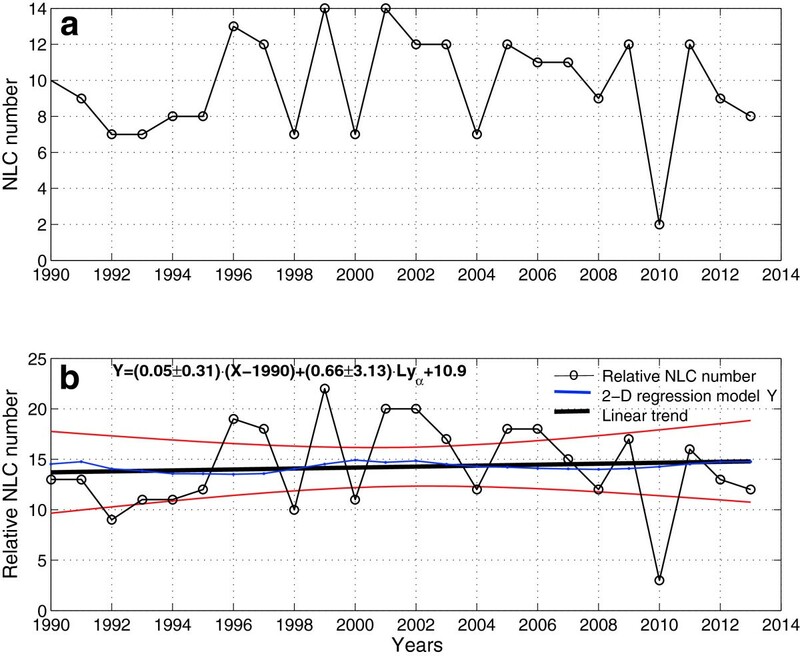 The updated PMC trends are shown in Figure 5 for the same year range (1990 to 2013) as in Figures 1, 2, 3, and 4. The derived trends both in the PMC occurrence frequency and PMC albedo for 50 to 64°N are about zero (or even slightly negative, in contrast to previously published results (DeLand et al. 2006, 2007; Shettle et al. 2009) and statistically insignificant. Thus, the dispute regarding the disagreement between the mid-latitude PMC and NLC long-term trends should be put to rest. Trend in PMC activity. The same as in Figure 1b, but for PMC occurrence frequency and albedo at 50 to 64°N. The data consistent with DeLand and Thomas (2014) are provided by M. DeLand. Dependence of NLC presence/absence on mesospheric conditions. Results of the summer temperature and humidity measurements in 2007 and 2008 by the MLS/Aura instrument at 60°N and baric height of 0.46 Pa. The longitude and time are taken as closest to a single event at each of the sites of the Northern hemisphere network for noctilucent clouds observation: namely, either for absence of NLC under clear weather (red dots) or NLC occurrence of small brightness (green triangles) or occurrence of bright NLC (blue circles). Additional convincing evidence of mesospheric clouds' sensitivity to the relative humidity has been given by Rong et al. (2012). According to their results based on satellite measurements at 65 to 85°N around the summer mesopause, there is fairly high correlation (for the sufficiently bright clouds at least) between the cloud ice mass densities observed and ones calculated from the cloud model suggesting the cloud ice mass density is proportional to the difference between water vapor pressure and the one for the saturated vapor. The aforementioned results on sensitivity of mesospheric clouds to the surrounding air temperature and humidity yield, with some reservations, a tentative hypothesis that the NLC presence or absence at approximately 60°N is controlled mainly by temperature and humidity of the surrounding air. Therefore, a zero trend in the number of NLC suggests a zero trend in the number of summer nights with relative humidity more or equal to 100%, at least for the year range considered. The complete NLC absence before 1885 (Gadsden and Schröder 1989; Dalin et al. 2012) corresponds to another climate condition of the summer mesosphere, that is, the relative humidity lower than 100% in the entire NLC environment. It might be due to either much higher summer mesosphere temperatures or a much lower water vapor mixing ratio, shifting substantially downward the temperature - relative humidity dependence in Figure 6. Thus, the approach based on the NLC sensitivity to the relative humidity agrees with the idea of Thomas et al. 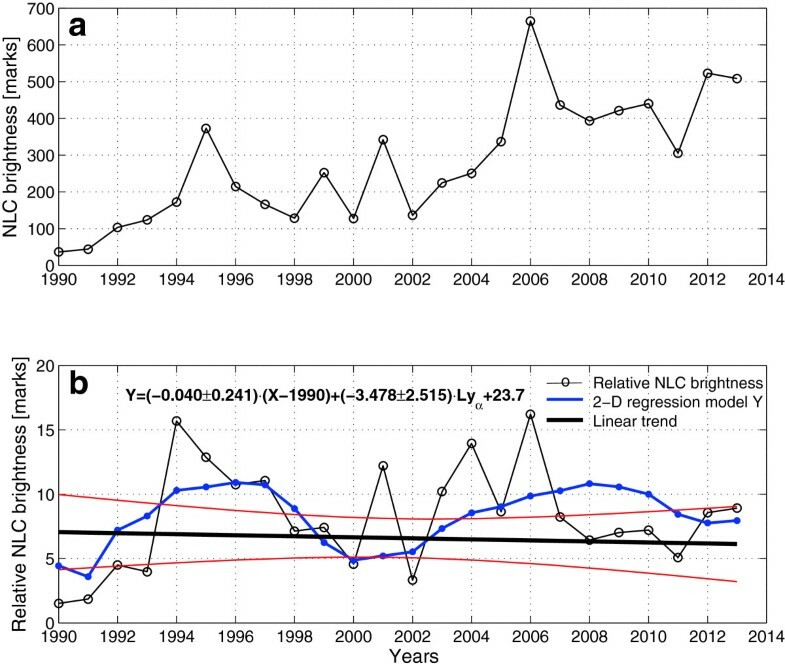 (1989): ‘…before 1885 there was insufficient water vapor routinely available at the mesopause to form visible clouds.’ Moreover, since there are no statistically significant long-term trends in both the Moscow NLC brightness and satellite PMC brightness at midlatitudes, one can draw a conclusion regarding a zero long-term trend in the amount of water vapor in the summer mesopause, since NLC/PMC brightness is very sensitive to the H2O concentration, with the power index varied between 4 and 8, depending on model parameters (Thomas et al. 1989). One can estimate uncertainties in the water vapor long-term trend based on our brightness trend uncertainties. The Moscow NLC brightness trend was estimated as −0.4 ± 2.4 for a 10-year time interval. In other words, the Moscow NLC brightness trend should increase by 6 times (2.4/0.4 = 6) for 10 years to be statistically significant. If we take the power index varied between 4 and 8 by Thomas et al. (1989), we arrive at changes in the H2O concentration as between 1.6 and 1.3 times, respectively. If we take the power index varied between 2 and 3 by Lübken et al. (2007), we arrive at changes in the H2O concentration as between 2.5 and 1.8 times, respectively. The both estimates are huge for a 10-year time interval and would be clearly detected by current satellite measurements at mid-latitudes, but this is not the case. However, estimations given above are based on the suggestion of a zero trend in temperature of the summer mesopause. In this situation, a nearly zero trend in the NLC/PMC brightness at mid-latitude should indicate on a nearly zero trend in the amount of water vapor of the summer mesopause to keep the relative humidity unchanged. Generally, the both trends in temperature and water mixing ratio should be either statistically insignificant or of the same sign, otherwise the number of nights with 100% relative humidity and NLC brightness would not show a nearly zero trend. According to the regular noctilucent cloud observations near Moscow, Russia (56°N, 36°E), Vilnius, Lithuania (55°N, 26°E), and La Ronge, Canada (55°N, 105°W), during the period 1990 or 1992 to 2013, there is no statistically significant trend in either the NLC occurrence frequency nor in the NLC brightness when a weather correction to the NLC data is applied. 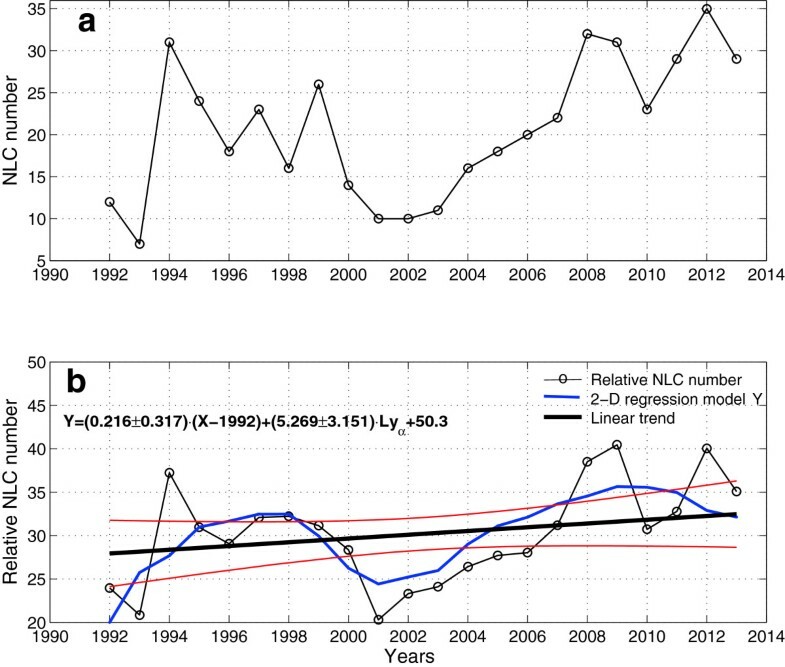 A comparison of long-term trends by satellite PMC observations and ground-based NLC observations reveals no substantial differences during the same year range at mid-latitudes. A joint analysis of ground-based NLC observations and Aura satellite temperature and humidity measurements near the locations of NLC shows that the vast majority of observed noctilucent clouds correspond to the condition of saturated or supersaturated water vapor. The hypothesis of temperature and humidity controlling the NLC occurrence, supported by the previous point of the summary, suggests a zero trend in a number of the summer nights with saturated or supersaturated water vapor pressure in the upper mesosphere. Nearly zero long-term trends in both the Moscow NLC and satellite PMC brightness at mid-latitudes suggest trends in upper mesospheric temperature and water mixing ratio that are either both statistically insignificant or of the same sign at the considered time interval (1990 to 2013) and latitude range 57 to 62°N. We are grateful to Matthew DeLand for providing us with the SBUV PMC data at mid-latitudes for 1990 to 2013. Thanks to the staff at the La Ronge Saskatchewan flight service station for their enthusiastic voluntary observing efforts since 1988. Thanks to all people participating in the Moscow NLC observing program in 1990 to 2013. The authors thank also Peter Völger, Evgenia Belova, Sheila Kirkwood, and Uwe Raffalski for the very useful comments and discussion during the manuscript preparation. The paper benefited from constructive comments and suggestions made by two anonymous reviewers. NP formulated and checked statistically one of the main ideas of the manuscript (about the relative humidity threshold for NLC) and drafted a large part of the manuscript. PD carried out statistical calculations for Moscow database and PMC and prepared main final illustrations. VP participated in the first-level data analysis for Moscow database after 2005 and helped to draft a manuscript and to prepare its final version. VR carried out the first-level data analysis for Moscow database before 2005 and participated in coordination. AD carried out most of the Lithuanian data related part of work and suggested substantial improvements in the first version of the manuscript. RB participated in the first-level data analysis and the design of results for Lithuanian database. KČ carried out the weather correction of the relative NLC numbers for the Lithuanian database. MZ carried out the Canadian data-related part of work and helped with the final version of the manuscript. All authors read and approved the final manuscript.